Possible Flooding And Blizzards In North Texas After Weekend Tornadoes : The Two-Way Oklahoma's panhandle could also see blizzard conditions Monday, and winter storms are expected from Texas through the Midwest and Great Lakes. Delores Downard salvages items from her son's house in Rowlett, Texas on Sunday, the morning after it was struck by a tornado. Parts of North Texas, already reeling from deadly tornadoes over the weekend, could see flooding Monday, the National Weather Service says. Blizzard warnings are also in effect in the Texas and Oklahoma panhandles and into western Oklahoma. Possible flooding Monday extends from northeast Texas to the Tennessee and Ohio River Valleys, while winter storm warnings, watches and advisories "extended from central Texas northeastward through the Midwest and the Great Lakes," the National Weather Service says. On Morning Edition on Monday, Bill Zeeble with member station KERA in Dallas spoke with victims of the Texas tornadoes that killed at least 11 people. "It's just unbelievable how quick it happened. And the sound of the roar. The roar," said Howard Rector of Garland, Texas. He and his family had to leave their apartment with nothing. North Texas officials say "as many as 1,450 homes were damaged or destroyed by at least nine tornadoes," The Associated Press reported. 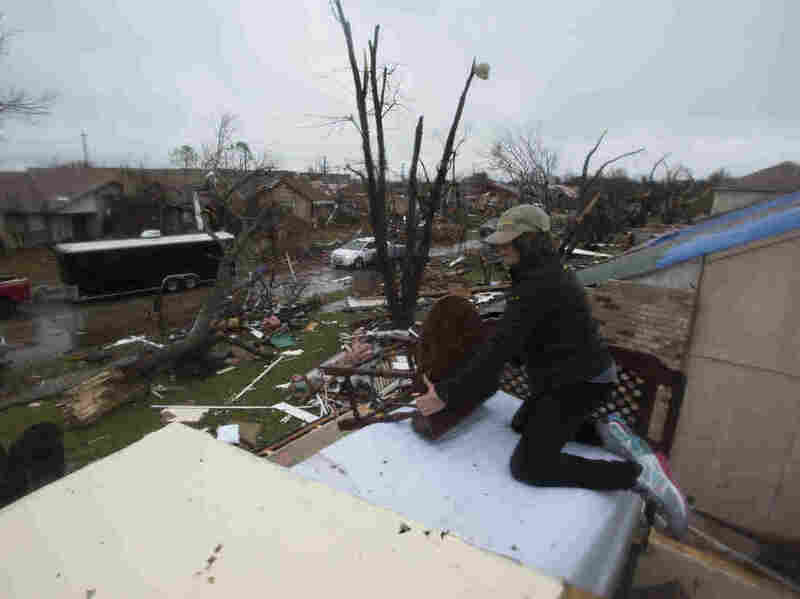 Severe weather in several states has killed at least 43 people since Wednesday. Georgia is also bracing for rain and rising water, Bradley George from Georgia Public Broadcasting told our Newscast unit. "Flooding has already washed out roads in the region and forced families to leave their homes," Bradley says, adding that the fire department has ordered residents living near the rising Flint River in southern Georgia to evacuate.